01.02.14 National dog show for all breeds in St-Petersburg САС: got "excellent", title Best Veteran Gordon Setter,BOB, BIG-2! Best Veteran in SHOW-3! 26.01.14 National dog show for all breeds in St-Petersburg САС: she is more then 10,5 years old. Today she was ВOB, BIG-1 and BEST VETERAN IN SHOW for all breeds!! 23.11.13 National dog show in St-Petersburg: - 10 and half years old) got excellent, Best Veteran in Breed, and in the final she was BEST VETERAN IN SHOW-2!!! Elly and Mak - BEST COUPlE IN SHOW!! 26.08.13 International dog show in Velikiy Novgorod (Russia):was BEST VETERAN with “excellent” today! 14.07.13 National dog show for all breedsSt Petersburg today: She was BEST VETERAN in show for all breeds!! 18.05.12 Austria, Salzburg. 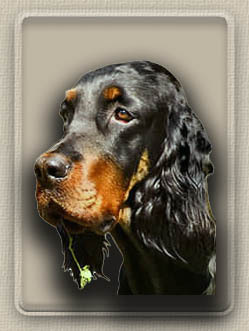 Here are the results: World Championship:"Еxcellent", title Best Veteran Gordon Setter and is VETERAN WORLD WINNER 2012 !!! 19.05.12 Setter club show "Derby" Salzburg":"Excellent" and was the best female veteran. ‎06.05.12 CACIB "Grand Prix Spring St Petersburg 2012" Best Veteran of breed and title BOB! 24.03.12 CAC dog show St Petersburg ВОВ, BIG-1, BIS Veteran-2 and Best dog in show-3!!! 12.02.12 Saint Petersburg. CACIB-show "Вaltic Triumph '12": Best Veteran of breed and title BIS Veteran-3! 28.01.12 St Petersburg Dog Show of all breads range CAC. ВОВ, BIG-1, BIS Veteran! 20.01.12 St Petersburg Dog Show of all breads range CAC. ВОВ, BIG-2, Res BIS Veteran! 25.12.11 St Petersburg dog show CAC range"Fidelis club" ВОВ, BIG-2, Res BIS Veteran! 25.12.11 St Petersburg dog show CAC range "Baltijsky cup" BEST VETERAN of breed, BOB, Best in group and got the title Best Veteran in show!!! 10.07.11 Paris.World Championship Excellent again too and was on third place in veteran class. 09.07.11 Paris.Championship of France: Excellent , was the Best Veteran Gordon Setter and as this took part in the finals against all other breeds. Elly was the Best Veteran of the French Championship on this day! 26.06.11 St Petersburg CACIB "White Nights 1" was BEST VETERAN and BEST OF BREED - BOB!!! 05.06.11 Tallinn, Estonia. 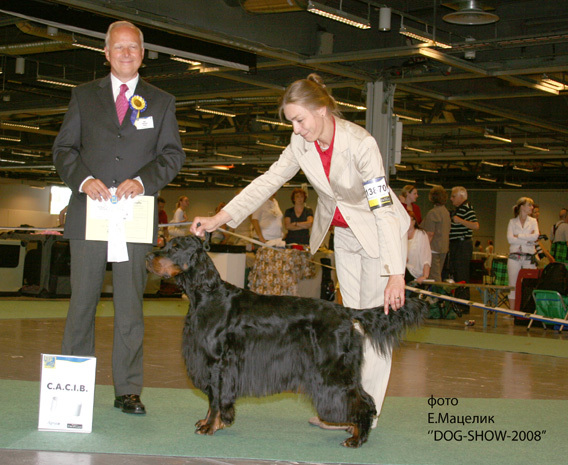 International Dog Show“Estonian Winner 2011”.BEST VETERAN , VETERAN WINNNER 2011, WINNER 2011 and best Gordon Setter - BOB!!! 04.06.11 The Setter Club of Estonia CW , BOS and BEST VETERAN IN SHOW . 21.08.10 Great Novgorod, Russia. International dog-show (CACIB-FCI) "Gospodin Velikij Novgorod-2010". Champion class. CACIB, ВОВ, BIG-1! Elly and Santana - Best Pair of the Show - 2!!! 20.12. 08 Vilnius, Lithuania. CACIB-range International Show"Vilnius Winter 08”. Champion class. CW, LT CAC, CACIB, and became ВОВ, BIG -3! Judge Renata Petkeviciene, Lithuania. Elly and Santana - Best Pair of the Show!!! 30.11.08 Russia, Saint Petersburg. Dog Show of all breads range CAC. Champion class. "Excellent” CAC, ВОS. Judge T.Satmont, Belarus. Elly and Santana - Best Pair of the Show!!! 22.11.08 Russia, Saint Petersburg. Dog Show of all breads range CAC "Baltic cup": Champion class.“Excellent” CAC, ВОS. Judge Yu. Ovsyannikova,Russia. Elly and Santana - Best Pair of the Show!!! 03.10.08 Hungary, Budapest, EURO DOG SHOW 2008 . Judge Penny Williams, UK.Working Class. CACIB, BOS, EUROPEAN WINNER 08!!! 04.10.08 Hungary, Budapest. Speciality show. Judge Jose Baddeley,UK. CAC, CW, BOS and the title CHAMPION OF SETTER CLUB, CHAMPION OF HUNGARIA!!! 08.09.08 Russia, Saint Petersburg. International dog-show (CACIB-FCI) "Nevskiy winner 2008". Judge Paula Hartinger (USA) . Champion class. "Excellent” CAC, CACIB, BOB, BIG-1, BIS - 3 !!! Elly and Santana - Best Pair of the Show - 2 !!! 25.08.08 Great Novgorod. International dog-show (CACIB-FCI) "Gospodin Velikij Novgorod-2008". Champion class. CACIB, BOB, BIG-1, BIS-3!!! Elly and Santana - Best Pair of the Show!!! Best of breed - BOB - out of 62 Gordons!!! She won the title of WORLD WINNER 08 and the title of CHAMPION OF SWEDEN! 29.06.08 Russia, Saint Petersburg. International dog-show (CACIB-FCI) “White Nights -2”. Champion class.“Excellent” CAC,CACIB, BOB, BIG-1!!! 18.06.08 Latvia, Ozolnieki. International dog-show (CACIB-FCI). Champion class.“Excellent” CAC,CACIB, BOB, BIG-2, Craft's qualification. 23.02.08 Moscow, Russia. International Dod Shows CACIB -range "Eurasia - 2008"-1 . Champion сlass CW, CACIB, ВОВ, BIG - 2!!! 23.02.08 Moscow, Russia. International Dod Shows CACIB -range "Eurasia - 2008"-1 . Class of Champions. CW, CACIB, ВОВ, BIG - 2!!! 17.02.08 Saint Petersburg Dog Show of CAC range “Winter Fairy Tail”. Champion сlass. CW, BOB, BIG-1 and BIS 4! Santana and Elly were the Best Pair of the Show! 17.02.08 Saint Petersburg Dog Show of CAC range “Winter Fantasy” Champion сlass CW, BOB, BIG-1 and BIS 3! Santana and Elly became the Best Pair of the Show! 10.02.08 Tallinn, Estonia. Setter-show - Nanional speciality show organised by Setter club of Estonia. Judges Lee van Genechten (Belgia). Champion сlass. CW, ВОВ, BIS - 3! 09.02. 08 Tallinn, Estonia. International Dod Show CACIB -range. Champion сlass CW, CACIB, ВОВ, BIG - 2!!! 12.03.06 the March 12 in SAINT PETERSBURG parade Champion was organized within the framework of show-project "ZOO RAY". The Parade-Champion was not shown action RKF, FAST, FATE and other cynological organizations. To participation were allowed dogs, having certificate of the Champion of any country and any cynological to federations..
12.06.04 Estonia, Piarnu. International dog-show CACIB-FCI. Junior class. CW, BJ, Junior Sertificate. 20.03.04 Region's all breeds of dogs show. Junior class. BJ. 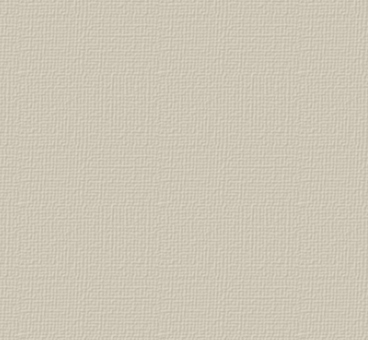 JCAC. Judge Nikitin (Russia). 14.03.04 Lithuania. Villnuse. International all breeds of dogs show. Junior class. LT, JW. Judge Zivile Povilaitiene (Lithuania). 13.12.03 CACIB "Neva Winner", SPb, Puppy-class - Big perspective, CW, Best puppy. 18.10.03 RKF Region dog-show, SPb, Baby-class – Big perspective, Best baby in show-3.